Just realized how long it had been since I posted anything on my blog. Sorry followers. I have been busy with prep for Christmas. I have an aunt on hub's side that has a birthday on December 30 which happens to be my and hub's 36 anniversary. In all the cards I have in my collection I didn't see anything that I liked well enough to send to Dear Aunt Selma. So I whipped this one up. 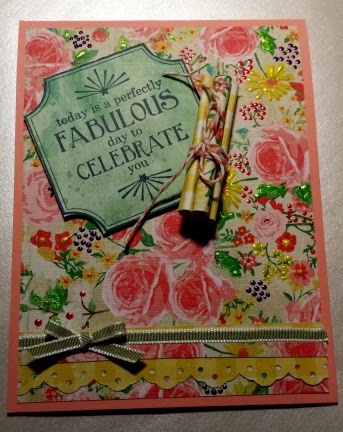 I added some Ranger liquid pearls to the rose patterned paper. I cut 3 pieces of the double sided cs in 2 inch squares then added a little glue runner and piece of twine for the wick, rolled them into candles. Tied them together in a bundle with more twine and voila, birthday candles. The sentiment is from Unity Stamp Co's everything amazing set. I think the sentiment fits Aunt Selma to a T.